Since Nicolas Bourriaud’s critical work Relational Aesthetics1 was first published in 1998, participation and relationality have become some of the most debated key terms in contemporary art. Expanding on the Marxian notion of social interstice, as well as on Félix Guattari’s ideas of proximity and micropolitics2, Bourriaud’s curatorial proposition of ‘everyday micro-utopias’3 framed relational aesthetics as a process of creation that is both individually negotiated and collectively produced. However, despite widespread interest in his ideas — likely encouraged by Bourriaud’s professional status as curator and co-founder of Palais de Tokyo —, his paradigm of art as ‘a state of encounter’4 raised a wave of criticism among art theorists and historians5. Amongst others, CUNY Professor of Art History Claire Bishop famously criticized the expanded field of relational practices6, including socially engaged, community-based, dialogic, participatory, research-based and collaborative art, and posed an antithetical question: what is spectacle if not the staging of a false consensus? At the core of her critique lies Bourriaud’s straightforward equation between participation in art and models of democracy in society7. Drawing from Ernesto Laclau and Chantal Mouffe’s notion of antagonism8, Bishop argues that dissent and confrontation, rather than consensus, are the constitutive features for radical democracy. Therefore, while Bourriaud’s utopias enthusiastically welcomed those kinds of relationalities that practices of participation temporarily propose, Bishop’s primary concern is that ‘participatory and socially engaged art has become largely exempt from art criticism’9, as artistic criteria are being overshadowed by ethical concerns within the social turn in contemporary art10. In fact, she argues, there seems to be little attention to form and content of such works, beyond a plethora of emancipatory claims made for these projects. Nevertheless, Bishop does not argue against socially engaged work to operate within the domain of art discourse. Rather, if transdisciplinary projects are to be taken seriously11, she highlights the need for deeper information about the kind and quality of relationships at stake, their agents and concerns. If we can talk about artistic methodology12 (can we? ), awareness of practice should be central: when involving someone in an artwork, what kind of exchange is taking place between artist and participants? How far do artists share knowledge with these subjects? Central to contemporary art agenda, collaborative and participatory practices did certainly not emerge from a vacuum. Duchamp’s conceptual participation of the audience, Beuys’ recognition of the universal freedom of being an artist and Kaprow’s happenings as primarily social events13, just to name a few examples, have increasingly blurred the borders between art and life, making spectatorship and participation territories of great concern in art theory. Further, the aesthetization of reality has been repeatedly pointed out by many voices in the field of social sciences, while an increasing number of contemporary artists engage in practices that have been labelled — not quite empathetically — as quasi-anthropological14. Scepticism from academia has not been missing; yet, from a contemporary perspective, anthropologists dealing with art and creativity have recently highlighted15 how, in assuming ‘the realm of human interactions and its social context’ as main theoretical horizon16, Bourriaud’s notion of relationality not only embedded artistic processes into the social, but also shifted the locus of creativity into social processes17. This resonates with issues of authorship, archive and documentation, creative process and sources, accessibility and legibility, amongst others, that increasing number of social and cultural anthropologists have been investigating, experiencing, observing and experimenting over the last decades by working alongside artists18. As an artist, art teacher and long-time experimenter with avant-gardes’ theories and methods, Italian visual artist Maya Quattropani engages in participatory practices using different medias including analog photography, installation, video and performance art. Her understanding of the artist as mentor and guide tackles the core of participation itself: elaborating on Futurism, Dadaism, Surrealism and Situationist International, Quattropani often invites and suggests visitors and spectators to participate in her actions. Nevertheless, while all her activities require certain level of openness towards experimentation, the kind and quality of participation being sought differ greatly. Through a shared exercise of reflection, Maya Quattropani and I recently discussed some key theoretical points in relation to her artistic practice and my understanding of anthropological methods. This excerpt focuses one of her projects, New Merzbau – COCALARE, which was designed in 2014 for the community of Falchera area, Turin (Italy). Mostly inspired by concepts and creative practices of Marcel Duchamp’s ready-made, Guy Debord’s psychogeographic drift and Kurt Schwitters’ Merzbau, the project-in-progress involved a class of eighteen middle school students and their neighbours. COCALARE was the final con-temporary sculpture and public action created by students, artist-teacher (Maya Quattropani) and some occasional neighbours. Its documentation has been recently exhibited as a site-specific installation at Palazzo Falletti di Barolo on the 10th anniversary of Ars Captiva (an Italian network of Turin-based art schools and contemporary art practitioners). 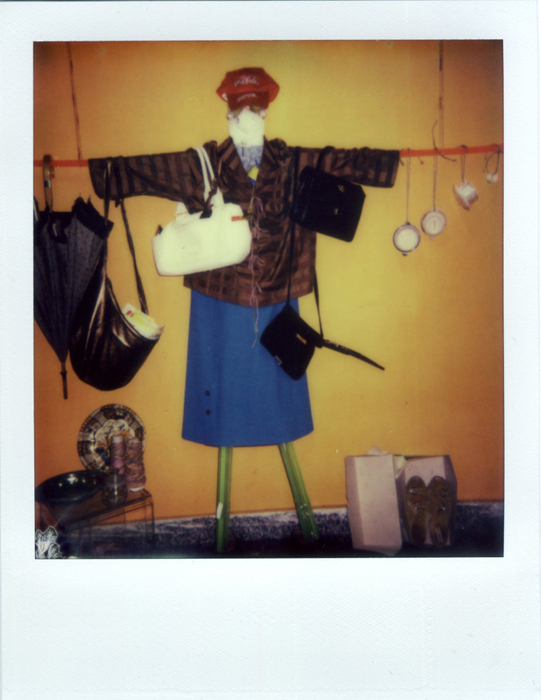 Maya Quattropani, COCALARE, Ephemeral sculpture with donated/recycled objects, Polaroid photo on instant film, 2014. Courtesy of the artist. Maya Quattropani: Looking at contemporary art practices dealing with participation, I often wonder how deeply is the artist aware of what s/he does. I feel there is a general, pretentious desire amongst contemporary artists to create always something new, something different. However, one must be aware of art history. References are important in art practice too. The line between fashionable trends and the use of widely-established art techniques and methods is very subtle; it basically is a matter of how you decide to tell a story… I mostly refer to Situationist International and surrealist artists in my works, sometimes quite literally by employing their games, methods, and creative practices. Art avant-gardes revolutionized the understanding of spectatorship and participation; I feel indebted to those minds and I am still reading and discovering possible contemporary declinations by mixing their methods and experimenting with them. 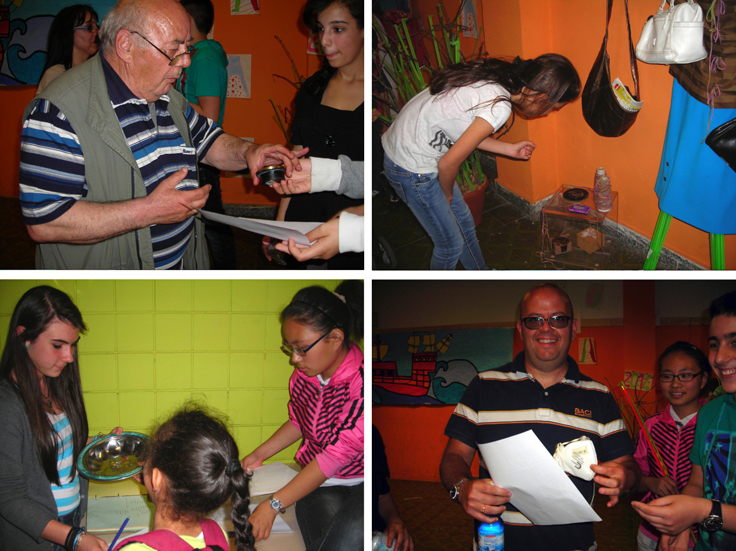 What is your experience of participation in art from a socio-cultural perspective? Alicja Khatchikian: I look at these practices curiously, but I generally feel distant from the art theoretical debate constructed around them. As an anthropologist, research is central to my way of thinking: first, research has certain timeframes that must be respected to make a reflection meaningful. I need time to digest my own ideas and elaborate experience. This process normally takes place in-between ethnographic fieldwork and ethnography, that is, through the transformation of experience into writing. While I do believe that there are artists working as researchers, I am aware that artists are not necessarily asked to do research. Nor are they inevitably interested in. 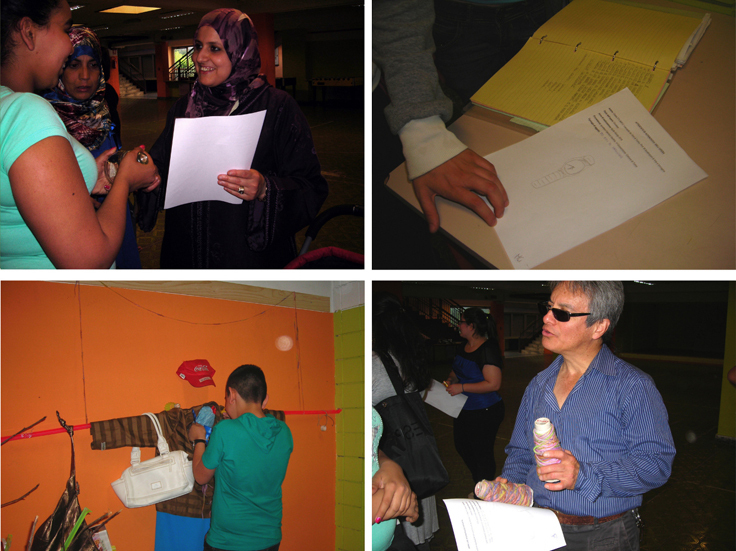 However, socially engaged and community-based art practices tackle a delicate subject: the community itself. Artists willing to work with specific communities might thus need to gain knowledge about them, their contexts, and their needs. They should, in other terms, develop a certain ethnographic sensitivity. For an anthropologist, this is a must; for an artist, this can be an option. Therefore, my concern regarding this kind of practices relates to the artist’s intentions behind those projects: how far is the artist interested in and aware of the values of the community s/he addresses? The lack of responsibility that some artists feel allowed to claim in the name of art can be damaging and the community can easily turn into spectacle. MQ: But how can someone control this process? In my opinion, this resonates with the lack of dialogue and intellectual collaboration between the arts and other fields. I honestly feel rarely represented by intellectuals: who are they? Am I being valued aesthetically, intellectually or purely economically? I am nostalgic of times when artists could create spaces for sharing knowledge. They questioned knowledge itself through their practice. I do not see that happening often nowadays. AK: Well, socially engaged and community-based art projects challenge anthropological practice in a way: they provide ’new ways of seeing’19 and exploring; they suggest performative strategies to ethnographic research. Yet by seeking for participation, these projects often seem to take for granted the community they address. Moreover, the lack of prolonged timeframes and the impossibility to develop long-term spatial interventions — sometimes due to financial restrictions or lack of funding, just as in ethnographic research — makes it hard for an anthropologist to take these works seriously from a research perspective. Collaborative practices between anthropology and art can offer valuable insights for both, but it does not work without compromises. MQ: I agree, artists are not know-it-all. There is much potential in working along with social scientists, psychologists, cultural anthropologists, architects … but we are not there yet. You cannot imagine to create a community if you are any yourself. AK: Do you think artists are generally interested in hearing opinions from other disciplines? MQ: It depends upon the artist, of course. For instance, in BRP Cough (2010–2015), an on-going research project on body reactions, I would be much more interested in hearing the opinion of a psychoanalyst, rather than an art critic. In fact, I would like my projects to be valued on different basis and taken into consideration by different personalities and professionals, who can have an insight into the work behind its materiality, its façade. AK: ‘Process’ seems to be a key word in your understanding of participation. MQ: Process is fundamental. Recordings and audio-visual documentation are part of the process and must be shared procedurally. Authorship is another critical issue in participatory art projects: who are the people participating? Where are they from? How and to what extent did they contribute to the project? I obsessively take notes when I am working; I write down details, information, names, places, … I believe this is a part of the research. This is process too. Over-aestheticized recordings of participated actions and activities look fake to my eye. AK: Are you suggesting that also the aesthetics of presentation should be discussed collectively? MQ: Of course, they should. Otherwise you are simply using some people to do your own artwork. You tell them what and how to do it and collect their homework. AK: So, what can be the space and role of an artist in participatory projects? MQ: My role as an artist foremost lies in offering a set of tools and sharing knowledge of them. And methods, of course: I tell you what kind of method we will be using and I coordinate the process. But there is always a certain failure rate, some space for variation and improvisation … You share control over process too. AK: What do you mean by ‘failure’? MQ: ‘Failure’ is not the proper word. I mean, if you accept to leave certain aspects of a shared process to the chance, you implicitly accept the possibility that something will not go exactly how you imagined. However, this is not a failure generally, quite an added value. AK: You define New Merzbau – COCALARE (2014) as the most participatory art project you have developed so far. Can you frame this experience in your practice and explain how everything started? MQ: I was teaching art history to a middle school class and we were dealing with Dadaism and avant-gardes. Namely, we were studying Duchamp’s concept of ready-made. I always combine my art history class with a laboratory, so that students can have direct experience of art practices. 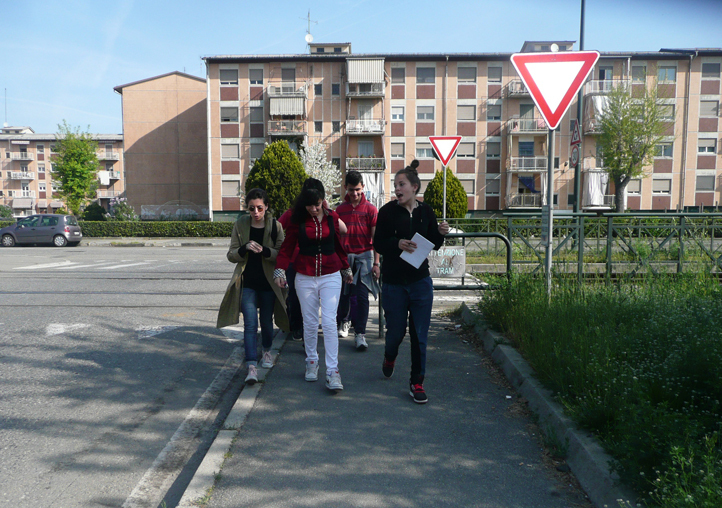 At that time, I was working in a school based in the neighbourhood of Falchera, a vulnerable suburban area of Turin. It is challenging there: school children have different cultural backgrounds and often come from critical social and environmental situations. The neighbourhood is divided between a newer and an older side. From a town planning perspective, you clearly recognize two different urban landscapes: ‘Falchera Vecchia’ was built in the 1950s and conceptualized as a self-sufficient city centre to accommodate new working classes in the immediate aftermath of the Second World War. There are mostly small, red-brick houses and several green areas around. Starting from the 1970s, the neighbourhood was increasingly populated by a new wave of immigrants, and ‘Falchera Nuova’ was constructed. The newest side looks quite different with high buildings, council houses and concrete walls. Children mostly come from there. The two are close, yet distant. Worldviews are different and inhabitants seem to embody these different landscapes. Children often suffer social conditions and it is not easy to engage them in activities… You need to catch their attention through action. In my class, for instance, the concept of ready-made and game theory about psychogeographic drift gave us the possibility to deal with issues of recycling, re-evaluation, responsibility, trust, and generosity, amongst others. Psychogeographic drifts and collecting activities, Falchera area, Turin, Italy. Ph: D. Houkmi; M. El Hamassi. Courtesy of the artist. AK: How did you deliver these notions to a group of youngsters? MQ: Giuseppe Pinot-Gallizio wrote that ‘possessions will be collective and have a swiftness of self-destruction’20; Marcel Duchamp said that every object can be art through a process of transformation21. When I explained these concepts to the class, they started taking out of their pockets every object and looked at me declaring: ‘So this art. And this is art. And this is art too!’ So, I had an idea. We were reading about Kurt Schwitters’ Merzbau22 and I realized its potential for my class: first, it is a ready-made itself; secondly, it entails participation, as each person contributes to its making by adding an object to its structure. […] We decided to explore the outside and move between the two sides of Falchera. We knocked on many doors asking for contributions; not everyone accepted our invitation though. We collected different objects: leather bags, a broken clock, old pair of shoes, a music stereo, some toilette paper, umbrellas, and many more. 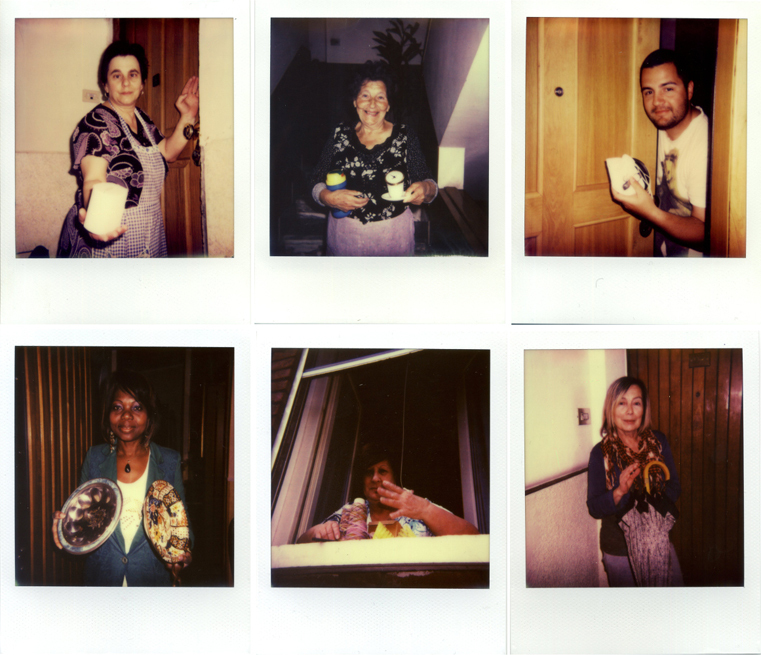 Maya Quattropani, Portraits of donors/residents, Polaroid photos on instant films, 2014. Courtesy of the artist. Each student had a role we discussed together depending on individual interests and attitudes: photographs, notes, drawings, maps and itineraries; everything was shared. Someone oversaw documentation through photography and fieldnotes; someone registered donations; others curated the collection and catalogued all the objects, as each item had a series number and a Certificate of Authenticity. The whole process was designed and documented, and all information shared online via cocalarenewmerzbau.wordpress.com, a blog that I curated together with students. 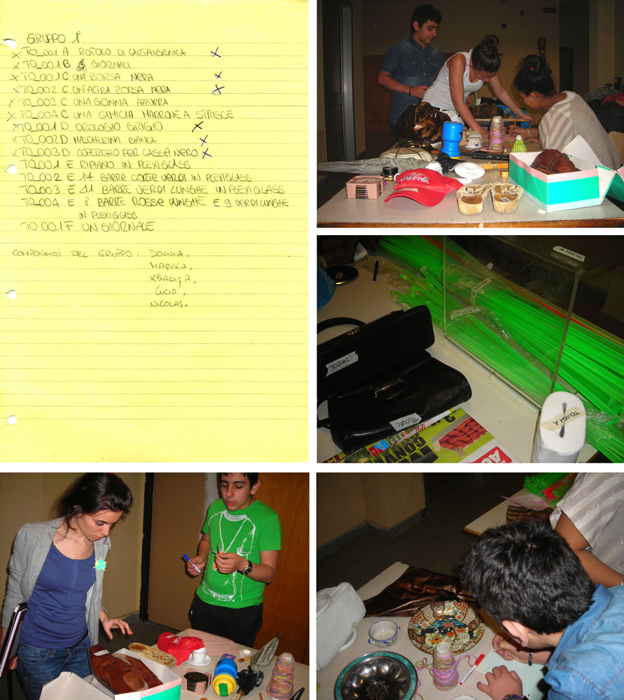 (up) Cataloguing activity, Deposit – Institute Leonardo da Vinci, Turin, Italy. Ph: M. Giacometti; R. Pellegrino. (down) Assemblage activity, Theatre – Institute Leonardo da Vinci, Turin, Italy. Ph: M. El Hamassi. Courtesy of the artist. AK: Did you encounter disagreements during the process? MQ: Everything happened quite spontaneously. As we left the school environment, we trusted our ideas and took into consideration every suggestion as a potential added value to the project. AK: How was the project perceived by inhabitants and students? MQ: They were all very excited. At the end of the school year, we organized a final event, a happening: we designed and printed posters that we hung around the neighbourhood. After having built our New Merzbau, we donated all objects to visitors, each one with its own certificate. People seemed fascinated by the fact that objects had gone through a process of transformation: as a matter of fact, what they received back, randomly and rigorously for free, was a piece of art. Someone even asked “What should I do with this now? Should I frame it and hang it on my house’s wall?” What was painfully disappointing, though, it was the lack of presence from the world I am supposed to belong. In fact, I invited to the opening different personalities from the art world, but nobody came. I don’t have witnesses to my action but the community of Falchera, the students and all my colleagues at school. Happening, Re-donation between students and citizens of Falchera area, Action view at Theatre – Institute Leonardo da Vinci, Turin, Italy. Ph: L. Chen; L. Cianflone; N. Incannila. Courtesy of the artist. AK: Don’t you think this simply relates to the fact that it was perceived as a school laboratory? AK: We return to the core of our discussion: what kind of participation and for whom? The artist-conceiver normally retains control over the creative process and its final outcomes: ‘co-producers’, or participants, take part in the making of a work, but rarely are consulted in decisions regarding materials selection, their editing and presentation. Your experience in COCALARE seems different, though. MQ: I have been working with different kinds and degrees of participation. New Merzbau is perhaps the most participative project I ever realized, meaning that its creative process has been dialogical and shared throughout all its phases. Within this frame, my role as an artist was one of supervision, we could say. In other works of mine, participation entails different degrees of exchange, whereby spectators are invited to participate in my actions through specific guidelines. There is no involvement beyond the phase of presentation. But when line between spectatorship and participation is both conceptually and practically crossed, the creative process is radically different. Does collective consciousness exist? If so, how can we shape it? 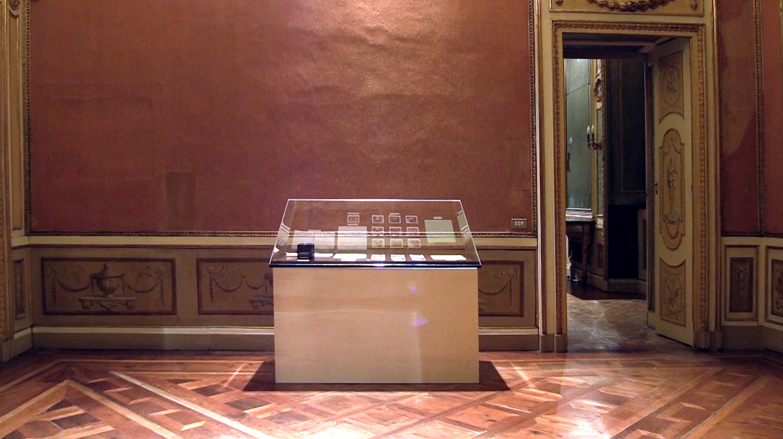 Maya Quattropani, New Merzbau-COCALARE, Archive on display case, Site-specific installation, view of Sala di Diana at Palazzo Falletti di Barolo, Turin, Italy, 2016–2017. 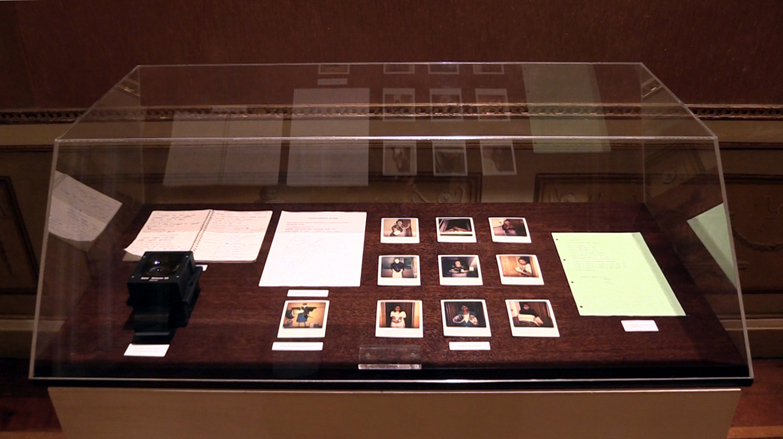 On detail: Notebook, Slides on lens, Authenticity Certificate, Polaroid photos on instant film, Inventory on paper. Courtesy of the artist. 1 Bourriaud, N. (2002), Relational Aesthetics, trans. S. Pleasance and F. Woods with the participation of M. Copeland, Dijon: Les presses du réel. 2 See Guattari, F. (1984), Molecular Revolution, London: Peregrine. 3 Bourriaud, Relational Aesthetics, p. 31. 5 See also Kester, G. (2006), ‘Another Turn’, Artforum, 44 (9): 22. 6 Bishop, C. (2006), ‘The Social Turn: Collaboration and Its Discontents’, Artforum, 44 (6): 178–183. See also Bishop, C. (2012), Artificial Hells: Participatory Art and the Politics of Spectatorship. London and New York: Verso. 7 Bourriaud, Relational Aesthetics, p. 57; Cf. Bishop, Artificial Hells: Participatory Art and the Politics of Spectatorship, p. 279. 8 Laclau, E. and C. Mouffe (2001 ), Hegemony and Socialist Strategy: Towards a Radical Democratic Politics, London and New York: Verso. 9 Bishop, Artificial Hells: Participatory Art and the Politics of Spectatorship, p. 23. 10 Bishop, C. (2006), ‘The Social Turn: Collaboration and Its Discontents’, Artforum, 44 (6): 178–183. 11 http://www.contextualpractice.files.wordpress.com/2011/08/bishopinterview.pdf (accessed January 31, 2017). 12 Klein, J., ‘What is artistic research?’, Research Catalogue [Online], published online on March 30, 2010. URL: https://www.researchcatalogue.net/view/15292/15293/0/0 (accessed October 17, 2016). 13 Sansi, R. (2015), Art, Anthropology and the Gift, London and New York: Bloomsbury. 14 Foster, H. (1995), ‘The Artists as Ethnographer’. In George Marcus and Fred Myers (eds. ), The Traffic in Culture: Refiguring Art and Anthropology, Berkeley, CA: University of California Press: 302–309. 15 Blanes, R., A. Flynn, M. Maskens and J. Tinius, ‘Micro-utopias: anthropological perspectives on art, relationality, and creativity’, Cadernos de Arte e Antropologia [Online], Vol. 5, No 1 | 2016, published online on April 1, 2016. URL: https://cadernosaa.revues.org/1017 (accessed January 29, 2017). 16 Bourriaud, Relational Aesthetics, p. 14. 17 Blanes et al., ‘Micro-utopias: anthropological perspectives on art, relationality, and creativity’, para. 32. 18 Amongst others, see: Marcus, G. (2007), ‘Notes on the Contemporary Imperative to Collaborate, the Traditional Aesthetics of Fieldwork That Will Not Be Denied, and the Need for Pedagogical Experiment in the Transformation of Anthropology’s Signature Method’, ARC Exchange, 1: 33–44; Sansi, R. (2016), ‘Experimentaciones participantes en arte y antropología. Participatory Experimentation in Art and Anthropology’, Revista de Dialectología y Tradiciones Populares, 71 (1): 67–73; Schneider, A. and C. Wright, eds. (2005), Contemporary Art and Anthropology, Oxford: Berg; Schneider, A. and C. Wright, eds. (2013), Anthropology and Art Practice, New York: Bloomsbury. 19 Schneider, A. and C. Wright, (2006), ‘The Challenge of Practice’. In Arnd Schneider and Christopher Wright (eds. ), Contemporary Art and Anthropology, Oxford: Berg: 1–27. 20 Internazionale Situazionista 1958–69, No 3, Nautilus, Torino ed. 1994. Pinot-Gallizio’s manifesto was first published in Italy in November 1959 under the title ‘Per un’arte unitaria applicabile’, Notizie – Arti Figurative, No. 9. English version (Molly Klein transl.) is available online: http://www.cddc.vt.edu/sionline/si/industrial.html (accessed January 31, 2017). 21 Duchamp, M. (2005), Scritti, curated by Sanouillet M., translated by D’Angelo M. R., Abscondita, Milano. 22 Further information available here: https://www.moma.org/explore/inside_out/2012/07/09/in-search-of-lost-art-kurt-schwitterss-merzbau/ (accessed January 31, 2017). Alicja Khatchikian (b. 1988, Gorizia) is a cultural anthropologist and photographer. She completed with honours her master’s degree in Social and Cultural Anthropology at the University of Vienna with a thesis entitled Moving Bodies: An Anthropological Approach to Performance Art. She is member of the European Association of Social Anthropologists and has presented her research work in international conferences. Her current interests revolve around the intersections between ethnography and creative processes, with peculiar interest in photography, performative archives and collaborative practices between anthropology and the visual arts. She is currently based in Turin, Italy. Maya Quattropani (b. 1983, Ragusa) is an Italian visual artist, art teacher and researcher. She received a four-year degree in Painting and Photography from the Michelangelo Castello Academy of Fine Arts in Siracusa and a master’s degree in Visual and Performing Arts from the Albertina Academy of Fine Arts in Turin. Her research interests include Avant-garde art movements, experimental pedagogy, traditional psychoanalysis, urbanism and anthropology. Through play as a system, method and means, she attempts to stimulate participatory interest on theories about personality, communication, linguistics and mental-physic automatism. She conceives art as an exchange of ideas through collective experience between the artist and any interested community. Her works aim to create long-term artworks-archives with unpredictable results using different media, including analog photography, writing, performance art, drawing, collage, video and sound installation. Quattropani’s work is articulated in cycles, chapters and series, which have been exhibited in Australia, Europe, South Korea, and USA. She organizes art classes, workshops, game-action sessions and darkroom laboratories for private and public schools, non-profit organizations and international institutions.